We’re excited to announce an upcoming FixMe.IT 4.5.0 version update, which will include the long-awaited Multi-Window Control feature! Connect to multiple clients and work with their remote desktops simultaneously: easily view and control all connected remote desktops on your screen. 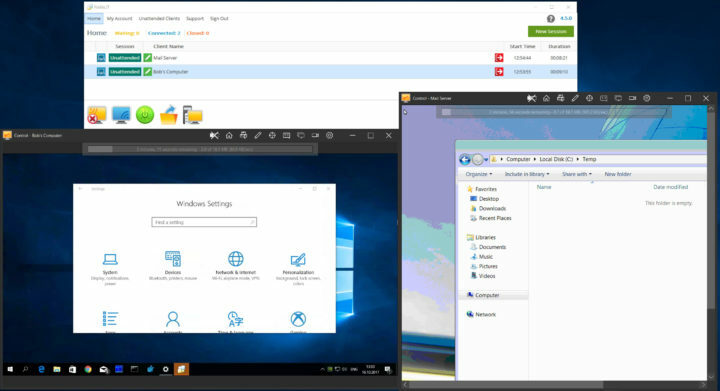 Exchange files and data with each remote desktop independently. Select Scaling and Image Quality settings for each remote desktop window independently. When working on this release, our development team dedicated its greatest effort towards fully ensuring the aspect of clipboard sharing privacy. This means that the clipboard can be simultaneously shared with each individual client and expert, while remaining fully isolated from other clients. Subscribe to our blog, join us on Facebook, Twitter or LinkedIn, and stay tuned for more information about this exciting update! Major Techinline 4.0 Version Update: Highly Anticipated Multi-Session Feature is now Available!